With the popularity of kayaking and kayak fishing steadily on the rise, more and more people are beginning to get away from the traditional canoe and switch to kayaks for their camping excursions. But there are several things that a person must take into consideration before attempting to camp this way. 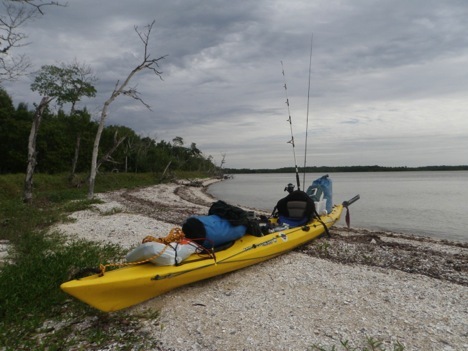 Here are a few tips to keep in mind when planning a camping trip via kayak. My number one rule for camping out of a kayak is that if you aren’t willing to lose it, keep it below deck. The question isn’t whether or not you’re going to flip one day; it’s when. Paddle enough, and it’s almost a guarantee that someday you’ll capsize in the kayak. Even well strapped down gear can break free during a spill and one runs the risk of losing precious gear for good if it’s not stowed away safely. Vital gear like emergency radio, water, food, and a tent should be kept within the kayak rather than on top. Losing gear like that can instantly end a camping trip and make things much more difficult on yourself. Think of camping from a kayak as almost like hiking. You want to carry everything you need, but you also want to be as light as possible. Unlike a canoe that can easily handle several hundred pounds of gear, a kayak is limited on space. In addition, a really heavy kayak in the water will tend to go through waves, rather than over them. This often leads to getting far wetter than you would normally. If you’re paddling long distances, a light kayak will help save your arms and shoulders from feeling like they’re going to fall off. An anchor is one piece of gear that every kayaker should have. They come in handy both while fishing and while just traveling. It’s a simple task to toss out the anchor and take a break while paddling, and doing so will prevent you from possibly losing ground to currents or winds. When it comes down to actually camping, I like to pull the kayak out of the water (if possible) and toss out the anchor on dry land. Fluctuation tides or inclement weather conditions could come float the kayak in the middle of the night. And the one piece of gear that you absolutely cannot afford to lose is the kayak itself. 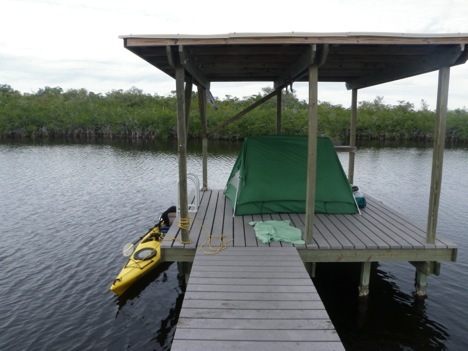 When camping on something like a platform or dock, I still use my anchor and wrap it around the wooden posts or columns. Whether you’re paddling a sit-in or a sit-on kayak, getting wet is inevitable. Not only will you get wet, but so will your gear. That’s why when I pack up to go camp from my kayak, I make sure to keep things that need to stay dry inside dry bags. These waterproof bags have rubber seals and clips that can ensure a watertight seal. Things such as dry clothes, cookware, and food all go inside a dry bag. By putting things in dry bags, a paddler opens up much more available space on the outside of the kayak. 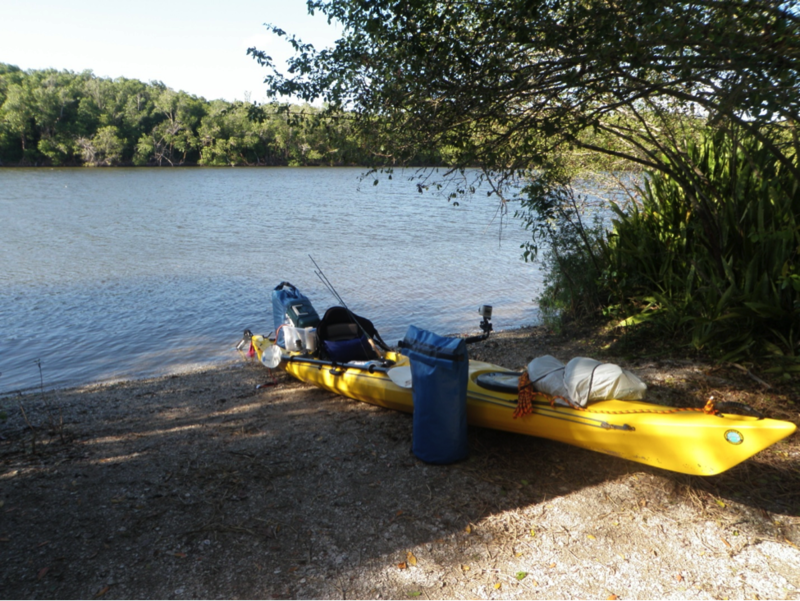 Bags can be strapped down with bungee cords or rope and doing so frees up room on the inside of the kayak. This holds true for almost any camping excursion, be it hiking, canoeing, or kayaking, but be sure to bring back up items. An extra paddle is a must when camping from a kayak. Imagine, for a second, how terrible it would be to break or lose your only paddle when you’re on a multi-day trip. Other items include ways to fix broken gear like rudders or seats. Spare rope, extra clothes, and alternate ways to make fire are things that I’m sure to always bring along. Redundancy is essential when it comes to being well prepared on a trip. Though it’s slightly less conventional than camping from a canoe, the kayak is definitely a good way to spend a few days in the wild. It’s just important to remember the kayak’s limitations and plan accordingly. If you follow these easy tips, you’ll be well on your way to having a successful kayak camping trip and realize just how fun it can be. Do you have any tips for camping in a kayak?